So, I finally decided to buy a TIG welder after many years of waiting and searching craigslist, hoping to find a used machine for a reasonable price. Unfortunately, most transformer-based (old) used machines are enormous and extremely heavy, and they are more difficult to use than modern inverter-based machines. 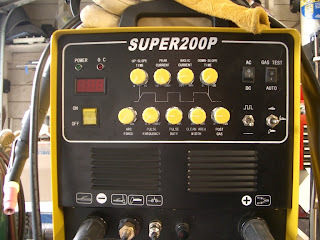 Finding a used inverter machine is possible, but the price for a used 200A AC inverter TIG welder made by an American company is at least $2-3,000. That is much more than I am wiling to spend on a hobby. So, the alternative is to buy a cheap imported machine off of eBay. I also decided to split the cost of the machine with a friend, making it a very affordable to get started with TIG welding. I know that some poor soul in China is probably making $1/day just so that I can have a welder, but I really can't justify an extra couple thousand bucks on the American machine without knowing intimate details about how the American and Chinese companies are run. Anyway, enough politics. On to welding! I bought the 200A pulse TIG machine with the plasma cutter feature. This is advertised on eBay by a number of different sellers. I bought mine from Everlast, who is located very close to me in San Mateo, CA. I drove up there, paid by credit card in person, and brought the machine home. The machine was packed well, and came complete with all accessories (including an argon regulator) except tungsten electrodes and collets. I also bought a 40 cu-ft Argon bottle from a local welding supply store, which I exhausted very quickly. I was supposed to get 2 hours of pedal-down welding time out of that bottle, and I might have, but it sure seemed to disappear fast. I upraded to an 80 cu-ft bottle, which is the largest size that I can easily lift. The Chinese argon regulator scared me a little bit since it is going to be holding back over 2000 psi of gas, and could be a hazard if not built and tested properly. To my surprise, it actually seems to be built exceptionally well. It has a good heft to it, and regulates the gas flow very easily and accurately. It has not given me any problems at all, and I am not worried about it. The torch itself is a pretty standard air-cooled model. It came with a selection of gas cups, and short and long back caps. 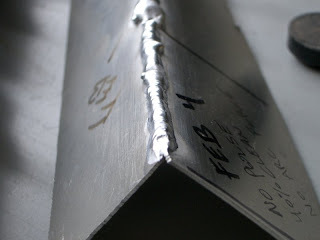 After a few hours of practice, these are my best aluminum welds (6061 sheet with 4043 filler), open corner weld. The top photo is 1/8" sheet, the bottom is 1/32"
In later posts, I will talk about specific machine settings. Overall, I am very happy with this machine, and would recommend it to other people looking to get started with TIG welding. Search my blog for other TIG- and welding-related stuff. I bought the new Everlast 200DX IGBT. I couldn't be pleased more. It also has AC frequency to 250Hz. Amazing machine for the price: stick, AC/DC and metal sturdy pedal. Compare that to the Diversion 165 for much more and only 165 amps. No stick, no AC frequency, no flow meter but gauges, no pulse, dinky plastic pedal that you have to pay extra for and only preset adjustments. It welds amazing for stick also as my first weld with DC 7018 was just about perfect. This is my sincere remarks I would be the first to say anything negative if true. New to TIG recently got my first 'stack of dimes' look. A great welder and a steal for the money especially with the excellent customer support. I emailed them a couple of times and got almost instant replies. Bravo!!! I just borrowed a lincoln electric AC/DC tig from a friend of mine. I want to build an aluminum proton pack replica from Ghostbusters. I've gone through two argon refils already and I can't get it to weld. I can't get a stack, all I get is a nasty gray ashy skin anytime I try a pass. I've tried with pulse, without it, cleaned the aluminum with a brush, left it without brushing... It just doesn't work. Whatever setting I need to change, I can't find it. I'm very happy that it worked out for you right out of the box..
1. Make absolutely sure that you know what kind of aluminum you are welding. Buy some alumium that is stamped "6061", so that you know the base metal is weldable. There are some aluminum alloys that cannot be welded. 2. Check that you are using %100 pure argon. CO2, mig gas, etc, will not work. It must be pure. 3. For clean metal, the AC balance control can be be pretty far to the "negative" side (penetration). However if you are having a lot of problems with oxidation, try moving the balance control toward the "positive" side (cleaning). Use only AC, of course. 4. Use only a dedicated stainless steel brush to clean your aluminum before welding. Do not use the brush to clean anything except aluminum. You may want to buy a new brush to be sure its clean. 5. 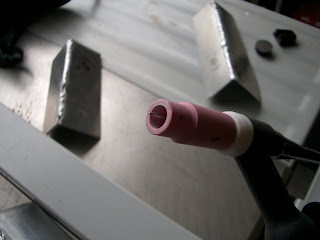 After wire-brushing, give the metal a quick wipe with acetone, then move the acetone bottle away from the welding area. 6. Grind your tungsten on a clean grinding wheel to a sharp point. I would recommend ceriated or rare-earth tungsten. Pure tungsten and even thoriated will work, though. Good luck with your project, I hope this helps. Leave another comment if you have time. So after a year & 2 days from your initial post, do you still have the Everlast? just wondering if it has kept up without a hiccup. Been considering a one myself & have read many good & bad stories of these Chinese made machines. just looking for another "It is still great" or "It fried 1 month into service"
Anonymous, I still have the welder and it has been working very well over the past couple years. The machine has its quirks, though. For example, during arc welding and plasma cutting, the foot pedal must be connected to the machine to control the amperage of the operation. It's possible to adjust the foot pedal's maximum amperage setting knob, then just floor it, but the pedal must be connected and depressed for the machine to operate. I mostly use the machine for TIG welding on aluminum and stainless, so I always use the foot pedal anyway. 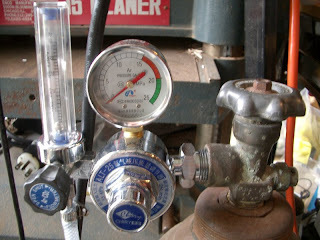 Use the search box in my blog to search for "welding" , "fermenter", and "tig" to see some projects that I have posted. I have not had any problems with the machine (knock on wood). I almost always use a large gas lens setup with 3/32" tungsten. I could never understand why anyone would use a smaller gas cup or lens, or why anyone would want to use a thinner tungsten. I've tried the .040 and 1/16", but there doesn't seem to be much benefit using them on thin materials. My tig setup almost never changes for any material/thickness. 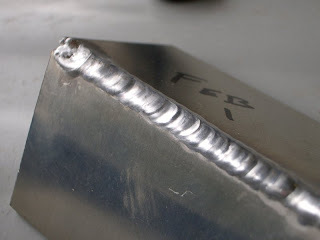 The arc doesn't always start very easily, but this may just be a fact of life in TIG welding. I've only ever used a few different machines in my time, so I am not sure how this machine compares in arc starting. On clean aluminum, there is often a fair amount of sputtering until the arc strikes and sustains. This is not a huge problem, though. The arc usually sustains within a couple seconds, and is easy to control during welding. Overall, I am very happy with the machine. It cost about 1/3 of a Miller Dynasty, and also does a good job with plasma cutting. I've used all of the machine's welding/cutting modes, and it gets the job done. As with most Chinese import tools, the quality is not as good as an American brand, but it is appropriately priced, and often is all you need for hobby/semi-pro work. Good luck! Thanks for the complete and useful review Ben... by the way What setup are you using on your table? I have just received my new Everlast PowerTig 250EX and a Power Plasma 80S,and after removing the covers and looking both of them over quite carefully I am very pleased. I have ran the tig for over 2 hours so far and it welds awesome! The Power plasma 80S has amazing power,and operates very smoothly. My background in welding has been as a professional welder in a job shop as well as in a manufacturing environment, for about ten years total. The last 15 years I have been self employed in the electronics industry as a trouble shooter and repair technician down to the component level. I now own 3 Miller machines,but now that I have experienced the performance and features of my new Everlast machines a couple of them may be for sale. You may want to check your line voltage and your connections at the location you have had two welders not work.Line voltage quality as well as a low or even a higher than normal voltage is a big problem with many inverter based power systems. A friend of mine said: Hobart 200DX have arc of instability. I used Hobart 200DX 1.5 years, it does not have any damage yet. A great machine. Well, check http://welderreview.com/miller-electric-welding-machines-reviews/ as well.